As more and more people move into large urban environments, whether for job opportunities, or educational opportunities, or to feel as though they are part of something bigger than themselves, the pressure of living in a crowded environment can really start to build. We have all sort of terms for the chaos of urban settings, like the concrete jungle, or the rat race. These terms more or less denote a feeling of being caged in and surrounded, by people, buildings, traffic, noise, etc. 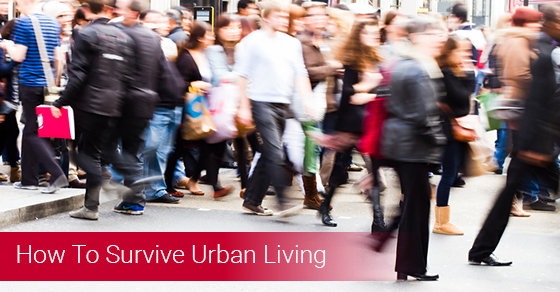 If urban living is driving you crazy, below are some tips for smartly and hilariously surviving it. One of the main drawbacks that keeps many people away from large urban environments is the lack of space. Small apartments mean giving up certain things that simply won’t fit, like ironing boards. A hair straightener is the next best thing if you don’t have an ironing board. If there is one thing that most urban residents have in common, it’s their love of coffee. But, with rent so high in most large urban centres around the country, even around the world, every little bit of money you can save counts. Buying a coffee at your local coffee shop seven days a week can add up to quite a bit every month. If you spend $3 on your morning joe everyday, that’s $21 per week, which is roughly $80 per month, which adds up to roughly $1000 per year. That could be a week at an all-inclusive resort in Cuba or Mexico. Avoiding eye contact when trying to pass people in the street is a good way to make sure that you both don’t end up doing the “which way are we going” dance in the middle of the street. This is because when you lock eyes with someone, you tend to track their eye movement, meaning that if they look left to pass you on your right, you end up veering to the right. Keep to the Right on Stairs. In North America, it’s a general rule of the road, for pedestrians as well as vehicles, to travel on the right. If everybody understood and incorporated this into their day to day movements about the city, there would be fewer annoyed people seen walking up and down some stairs. Part of city living means coming into daily contact with all sorts of people. People asking you for money, people stopping you to speak about a particular cause of theirs, people simply shouting at you for no reason. If you stopped to talk to everyone who demanded a little bit of your time, you wouldn’t be able to do the things you need to do. Keep your headphones in if you are simply not in the mood for interaction. You don’t even need to have music on. Simply having your headphones in will signal to people that you don’t want to be bothered. City living can be tough, beautiful, infuriating, all in the same day. Don’t let it get you down. If you are new to the city, or, sometimes more importantly, have been in the city too long, and need some help just maintaining your sanity, keep the above tips in mind and be as at peace as you possibly can be with your urban environment.